What is the Best Nap Length? More than 85% of humans find times in their day to takes naps. Many of these people are college students, and just like many other college students, I love any free time that I get during the day so that I can fit in my “daily nap”. On days when I don’t find time for a nap, I find myself feeling less energized. 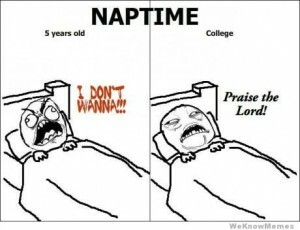 I’ve heard many different nap times that people have told me is the so called “prime” napping time. I decided to devote this blog post solely to finding out what the true is when it comes to what the perfect nap length is and why that particular length benefits us. According to sleep.org, the ideal nap time is just a short twenty minutes. The site says that this nap length improves both one’s attitude and energy level. With a shorter nap length, one doesn’t fall asleep very deeply so it is not hard to wake up and get back on track. WebMD also states a short nap length, anywhere from fifteen to twenty minutes, can help with sleep deprivation and also increase one’s performance for the remainder of the day. The longer you decide to sleep, the harder it is to wake up and not feel groggy. A nap that is anywhere from thirty to sixty minutes has positive effects on one’s body but can cause you to wake up feeling the opposite of refreshed, and it will be harder to carry on with your day. On the other hand, a nap that is long as ninety minutes can leave you feeling as refreshed as after a short, twenty minute nap because you are sleep along enough to have gone through the full nap cycle. This means that you will go through three stages of sleep: light sleep to deep sleep and back to light sleep. Hence, why it is easier to wake up; the less you are asleep, the easier it is to wake up. Sleeping for this long has been known to have many positive effects on one’s body. Some may ask how a nap compares to an alternative, such as drinking a cup of coffee. While they may both make someone feel more alert, caffeine has more negative effects on the body while napping can increase brain activity. Nap tip #1: One of the best ways to prevent falling into such a deep sleep is to prop yourself up slightly in order to avoid waking up feeling groggy. Nap tip #2: It is very helpful to choose a good time of the day to take your nap. This is a benefit so that when you wake up, it doesn’t have to be an all of the sudden movement, it helps to have time to slowly get up and then continue on with your day. Nap tip #3: Your environment can help a lot! Make sure you aren’t laying down next to anything that could stress you out – such as homework that you need to do but are putting off until the last second. This entry was posted in Uncategorized on September 15, 2016 by Catherine Drinker. I have always noticed that the longer the nap I take, the groggier I feel when I wake up. If I fall asleep for more than an hour, my body thinks its going into nighttime rest. If I take a two hour nap I wake up completely out of it. I have however, observed truth to nap tip number one. If I doze off in class (not Andrew’s class of course! ), I am always in a super light sleep. If someone next to me so much as shuffles some papers of drops pen it usually will bring me back around. I am not the type of person who can take a twenty-minute nap. My nap time is minimum 2 hours. It usually takes me about 10-15 minutes to fall asleep; personally, I don’t see the point of taking a nap when I’m just going to feel tired afterwards! 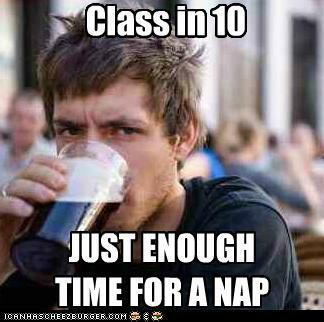 Napping in between classes is definitely not an option for me, I for sure wouldn’t make it to my next class. Props to the people who can actually successfully nap for a short amount of time and actually feel energized. Here’s an interesting article about whether napping is good for us or not: http://time.com/3449959/is-napping-healthy/. All in all, it’s an interesting topic and I very much enjoyed reading your take on it! I definitely agree that oversleeping is a thing. Today I felt a little under the weather after my workout so I decided to take a nap because I was having a hard time getting through all of my homework. I set a timer on my phone for 30 minutes until it was 8:00. I woke up after only 20 minutes and felt good as new, I was much more concentrated and focused. After reading your article I realize now why my body woke me up after 20 minutes because that was really all I needed to get me going again. I did not wake up from my nap feeling groggy this is thanks to your first nap tip. I was propped up on my pillows so I did not fall into a deep sleep. Check out this article from Harvard ( http://www.health.harvard.edu/newsletter_article/napping-may-not-be-such-a-no-no ) about the pros of taking naps. Thanks for a very beneficial blog post! Upon reading this, I found it humorous because I happen to fall in that fit in the 15% that don’t find time to nap throughout their days. It’s not that I don’t have the time, I just prefer to sleep for hours instead of napping for 20 minutes or so. I find it difficult to get up after sleeping for such a short amount of time. I like the fact that you include some tips for napping. Maybe I’ll try them out since I’m not too prone to nap. However I still cannot fathom just sleeping for 20 minutes. It’ll take me half that time just to all asleep! For some reason I would rather rely on having full nights of sleep. Here is a link about power napping vs. actual sleeping. I myself also enjoy a nice nap so i found this article very interesting. I recently saw a product that will help you nap more efficiently called Napwell. The link to there website is here. The Napwell wakes you up gradually which is something you talked about in your blog. You can set how long you want to nap and then the mask slowly gets brighter to help you wake up slowly and not abruptly. After reading this article i will definitely start to use these tips especially the length of the nap. 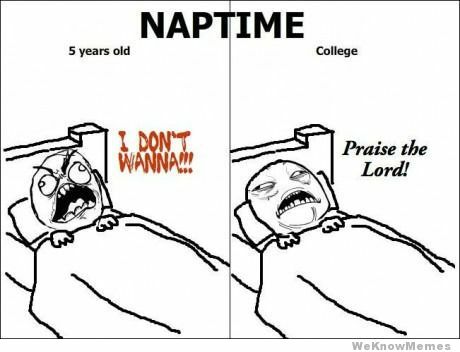 Like you and many other college students, I love my naps. In fact, as I get older, I begin to appreciate having some time to nap during the day and actually look forward to napping. Actually, I think that I am not myself if i do not have some time to unwind and nap. Unfortunately for me, taking a 20-minute nap is so much more easier said than done. I always like to tell myself that I am only going to sleep for 30 minutes but end up waking up three hours later. I will definitely try out your nap tips. Hopefully they make me feel less groggy when waking up. I am the type of person that can fall asleep whenever, wherever. I also have always been told that the “prime” number of minutes to nap is 26 minutes. After trying this multiple times, I have found that anything less than 90 minute naps leave me feeling even more tired, and frankly even more annoyed than before my nap. Once I decide that I am going to take a nap, I prefer to let myself sleep until I wake up. Sometimes this can be hours, but I feel that if I am that tired than my body needs the rest. Do you think “oversleeping” is a real thing, or a myth?